Heroes by Gérald Sibleyras, Langham Court Theatre, Nov 13 - 30, 2013. Review. You are here: Home / Arts / Heroes by Gérald Sibleyras at Langham Court Nov 13 – 30, 2013. A review. Heroes by Gérald Sibleyras at Langham Court Nov 13 – 30, 2013. A review. Heroes by Gérard Sibleyras, translated by Tom Stoppard, currently playing at Langham Court Theatre until November 30, 2013, is a gentle, sweet , funny and slightly saucy play that treads carefully on well-worn ground, without becoming maudlin or hoary. 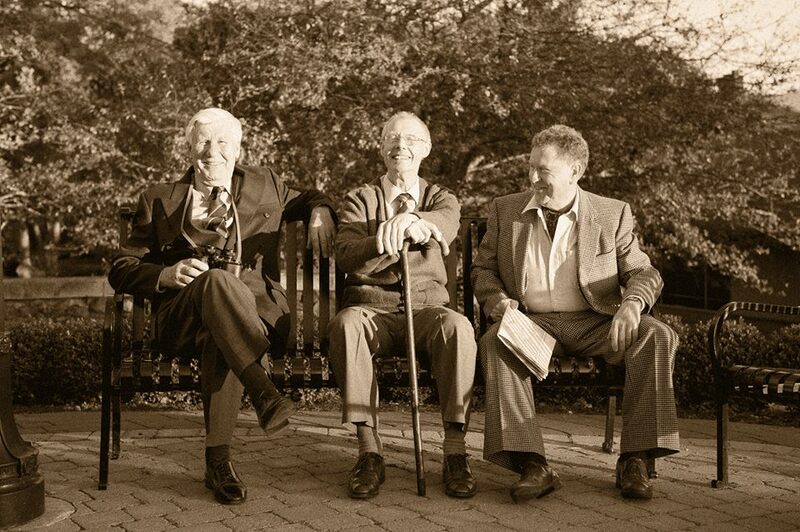 Travel to Europe, and in every village or town square, at every coffee counter or small bar, pétanque field or outdoor chess game, you’ll see them gathered – the old men. Their days revolve around small conversations, stories told again and again – past exploits remembered. We meet irascible Gustave (Bill Christie), kind Henri (Alan Omerod) and paranoid Philippe (Tom Holder) outdoors on “their” terrace – one they are prepared to defend against all the other pensioners. A magnificent stone dog (created by Anne Swannell who also did the scenic painting) becomes the fourth character. The three men have a well-established daily routine, and despite kibitzing with one another, we feel the sense of camaraderie they’ve developed. Their digs and jabs provide ample ground for jokes, and chuckles, as they press one hot button after another. Women are inevitably a topic of conversation and conjecture – revealing hair line cracks of jealousy in the friendships of these aging Lotharios, who still want to impress. To avoid complete and utter boredom, and inspired by Henri’s daily jaunts outside the walls, they begin to look for ways to plan a little adventure. Gustave famously takes charge. After all, he is a wealthy aristocrat, and former officer, used to giving commands and being obeyed. The others comply grudgingly. With Indochine (a former French colony) no longer an option, they settle on a far-off hilltop where poplars sway, enticingly in the breeze. In Canada, Lombardy Poplars were often planted by service men returning from WW II as a reminder of the trees that lined the country roads in Italy and France. Ted Andrews, writing on the symbolism of trees, says that poplars “reveal to us lost and forgotten memories of our dreams through the gentle whispers of leaves with every breeze” and the Celts believed they stood for “Victory, Transformation, Vision”. Henri brings his military and mountaineering training to the fore, with hilarious results, as the men take turns practicing their roping techniques, and carry one another over imaginary rivers. Philippe, prone to fainting spells due to shrapnel wounds, is increasingly incapacitated. In one heart-wrenching scene Gustave, full of bravado and curmudgeonly disregard for others, comes undone. Director Don Keith (who doubled as the set designer) ensures that his elderly gentlemen remain dignified, no matter how silly their antics. Natty attire by costume designer Lynn Cadrain adds to the gravitas they inspire, and bolsters the respect they deserve. Sound designer Odile Nelson’s extensive research revealed classics of the French “chansonnier” style to beguile us between acts – “Les Copains du Bord” (Brassens), “Le Piano du Pauvre” (Ferré) among others – and highlight the Mediterranean setting created by the villa. Lighting by Carol-Anne Moore captures the shifting light, and in one corner of the backdrop, clouds roll slowly by – a very fine touch. Sibleyras and Stoppard, working in close collaboration, provoke many questions and much reflection with this touching comedy. Regardless of age, and despite all appearances to the contrary (Gustave claims “I wouldn’t want a crowd at my funeral”), our deepest heartfelt needs are for companionship and worth. Heroes is an honourable legacy to the sacrifice of a generation all but disappeared. In selecting Heroes as part of their 85th season, Langham Court Theatre has not only provided choice roles for older actors, but reminded us all, in this month of remembrance, of the true costs of war. Disclaimer: I was provided with complimentary tickets to Heroes for the purpose of writing a review. As always, I retain complete editorial control over all content published on my blog. Better Living – Langham Court Theatre. A review.